As we go forward growers will want to have effective programs for the management of all of The Big Three insects at this time: Blueberry Maggot (BBM), Aphids, and Spotted Wing Drosophila (SWD). BBM is often managed with the neonicotinoids, Assail or Admire. Aphids are also managed most efficiently with the neonicotinoids, but with the addition of Actara. As a class, these compounds Do Not work well for SWD. Some investigators have seen limited SWD by Assail and Actara. If you use these, use them only once at the beginning of the SWD season, and only if you really need aphid control. Synthetic pyrethroids do work well for SWD, and include Asana, Danitol, Hero, and Mustang Max. But…These are not the best materials for BBM, and they don’t really work on aphids. Lannate is a “second tier” product for aphids, and will also work well on SWD and BBM. 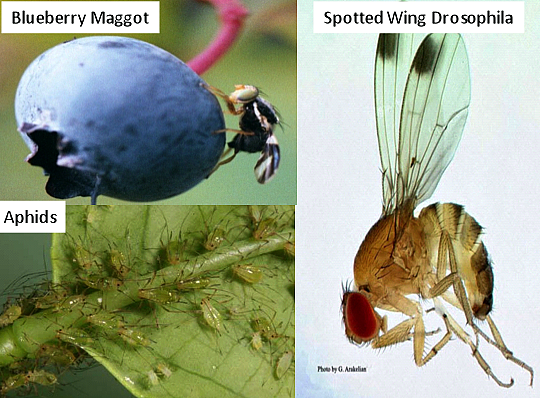 Aphids aside, other materials that will work on both BBM and SWD include Imidan and Malathion. Think about the population pressure. Delegate/Entrust will work well for SWD, suppresses BBM and does not work on aphids. As long as BBM populations are very low, e.g. “0-1” per trap, and early in the season, then the top BBM materials may not be needed, and you can concentrate on SWD, still controlling BBM. Later on SWD populations may become higher, as might BBM. Of course, if your BBM trap counts are “0” then you don’t have to treat for maggot.